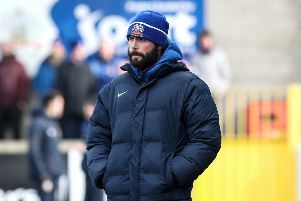 Ballymoney United made three impressive signings tonight (Thursday) giving Peter Cairns squad a boost as they return to league action after almost nine weeks without a competitive game. However,the players are no strangers to the Showgrounds having already played for the club when it was in the Championship. Goalkeeper Bryan Moore returns from Glebe Rangers along with returning midfielder Lee McLelland who was playing at Wakehurst. Previous top goalscorer Gerald Gillan returns to Ballymoney after a spell with Larne and winger Gareth Mclaughlin makes a comeback after spells with Bangor and PSNI.